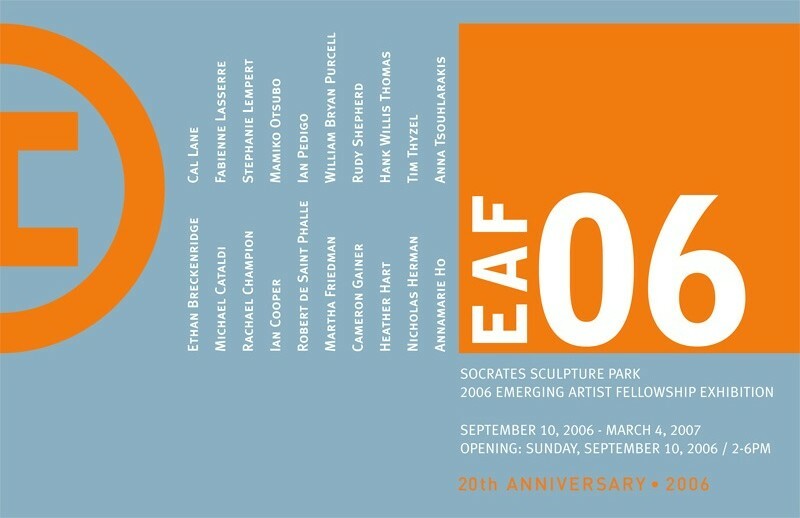 Socrates Sculpture Park is pleased to announce the opening of EAF06: 2006 Emerging Artist Fellowship Exhibition. This annual show features new works by the Park’s resident artists. To mark the 20th anniversary, we are highlighting Socrates’ founding commitment to supporting artists at an early and seminal stage in their career by doubling the normal number of fellowships and hosting twenty artists. This year’s EAF artists are Ethan Breckenridge, Michael Cataldi, Rachael Champion, Ian Cooper, Robert de Saint Phalle, Martha Friedman, Cameron Gainer, Heather Hart, Nicholas Herman, Annamarie Ho, Cal Lane, Fabienne Lasserre, Stephanie Lempert, Mamiko Otsubo, Ian Pedigo, William Bryan Purcell, Rudy Shepherd, Hank Willis Thomas, Tim Thyzel, and Anna Tsouhlarakis. This exhibition is made possible by the dedication and support of our volunteers and friends and by the generosity of: Altria Group, Inc., Lily Auchincloss Foundation, Inc., Carnegie Corporation of New York, David R. and Vivien Collens, The Cowles Charitable Trust, Elaine Dannheiser Foundation, Mark di Suvero, Foundation for Contemporary Arts, Maxine and Stuart Frankel Foundation, Hugh J. Freund, Lisa Gold, Agnes Gund and Daniel Shapiro, Independence Community Foundation, The Peter T. Joseph Foundation, JPMorgan Chase, Gabrielle and Herbert Kayden, Jennifer McSweeney, Richard and Ronay Menschel, Ivana Mestrovic, National Endowment for the Arts, New York State Council on the Arts, Ralph S. O’Connor, The Pollock-Krasner Foundation, Inc., Brooke Kamin and Richard Rapaport, The Ross Foundation, Rev. Alfred R. Shands III, Mr. and Mrs. Thomas Smith, Starry Night Fund of Tides Foundation, Strypemonde Foundation, Ursula von Rydingsvard and Paul Greengard, and The Van Lier Fund of The New York Community Trust. This program is supported, in part, by public funds from the City of New York Department of Cultural Affairs and by the Jerome Foundation in celebration of the Jerome Hill Centennial and in recognition of the valuable cultural contributions of artists to society. Special thanks to the City of New York, Mayor Michael R. Bloomberg, Queens Borough President Helen M. Marshall, City Council Speaker Christine C. Quinn, Assemblywoman Catherine Nolan, City Councilmember Eric Gioia, and the Department of Parks & Recreation, Commissioner Adrian Benepe. 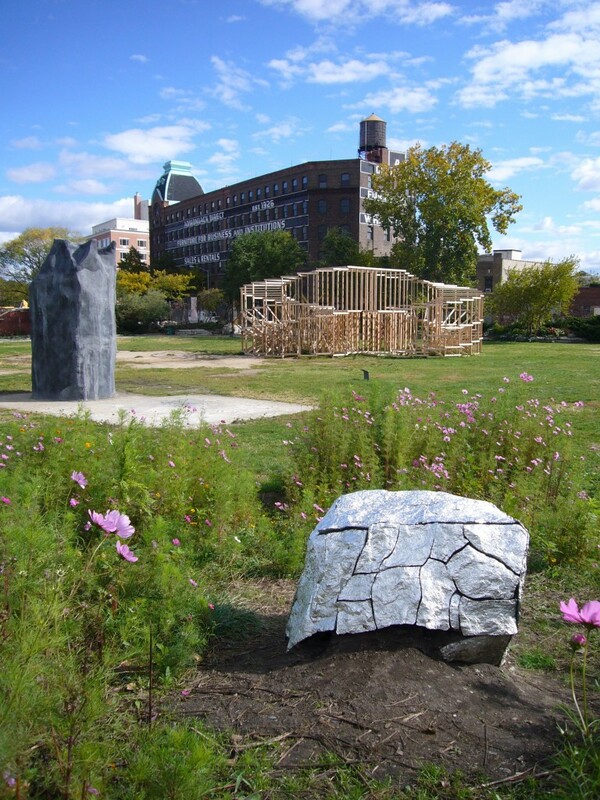 Socrates Sculpture Park is grateful for the generosity of Harold H. Anthony, Inc., Atelier 4, Inc., John P. Corrieri, Inc., E&T Plastic Manufacturing Co., Inc., Garlock East, ImageKing Visual Solutions, Long Island General Supply Co., Materials for the Arts, Plant Specialists, and Spacetime C.C.